My stomach had been very weak for a long time and I have a long history of digestive problems. My friend was able to notice my weight loss and advised me to go for a medical checkup. 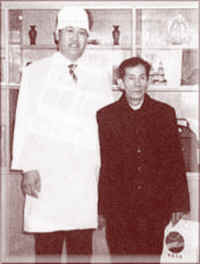 Autumn of 1990, I went to the hospital for an endoscope examination. The result showed that cancer had infected my esophagus and stomach, and both were in terminal stage. A surgery was performed and the doctor removed over 60% of my stomach. I felt very weak and tired after that. Excessive phlegm were present the week after the surgery. Two weeks later, they told me that none of the treatments worked. I left the hospital, but I still continue to take chemotherapy treatments. Side effects were also present. My condition was very unstable at this time and I started to retain water in my chest. I was then confined in the Zhongshan Tumor Specialist Hospital. I was told that I only had 1 month to live. I could not possibly leave my children! On January 21, 1991, my relatives recommended Tian Xian Liquid. As soon as I began taking Tian Xian Liquid, I began getting better. I then stopped using Western treatment. It has been eight years now and I`m still drinking Tian Xian Liquid in small dosage (so as to prevent and recurrence) and there is no sign of cancer. I survived!